South Salt Lake police investigating why immigrant allegedly stabbed his neighbor. South Salt Lake police have arrested a 20-year-old man in the apparent unprovoked stabbing death of a neighbor. 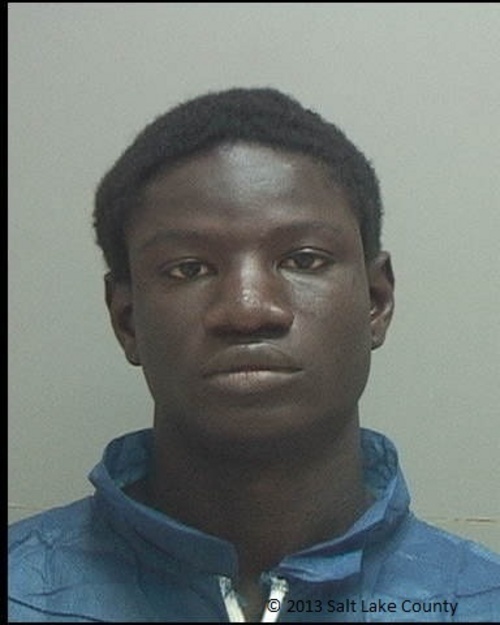 South Salt Lake Police Chief Chris Snyder said Ansumana Jadama, described as a West African immigrant, was being held Thursday without bail at the Salt Lake County jail. He was booked late Wednesday night on suspicion of first-degree felony murder and first-degree felony aggravated burglary. Police, responding to a 911 call from the victim&apos;s male roommate, found 48-year-old Rickey Magnuson bleeding and with a broken-off knife blade sticking from his abdomen about 9:15 p.m. Wednesday inside an apartment at 3400 S. 415 East. He was rushed to a hospital in critical condition but later died. Officers were able to contain Jadama, who lived next door, inside his apartment. Jadama would not respond to calls to surrender, so officers obtained a search warrant and  joined by police dogs and a Unified Police Department SWAT team  forced entry. "A knife handle was also found inside the suspect&apos;s apartment. Forensics [testing] will determine if it was part of the weapon used in the attack," Snyder said. Neighbor Lela White, who lives across the parking lot from Jadama, said she heard police yelling over a bullhorn at about midnight. About 2 a.m., she heard police shout a countdown then "blast" the door off an apartment. "It was an explosion," she said, "a big boom." Sometime before 3 a.m., White heard a popping noise that sounded like gunfire. The scene gradually calmed down after that, though White said police didn&apos;t completely leave the scene until about 9 a.m. Thursday. According to Snyder, Jadama was taken into custody without incident after officers forced their way into the apartment. While neighbors reportedly told police the suspect had shouted unspecified accusations at the victim earlier Wednesday, Snyder said that the "motive for the attack is unknown at this time." However, 3rd District Court records seem to point to a history of mental illness and threats of violence in Jadama&apos;s recent past. On June 10, 2012, Jadama was arrested after kicking in the door of his sister Ajamama Jadama&apos;s apartment and then demanding money under threat of death. The court issued protective orders for the woman against her brother, and he eventually pleaded guilty to domestic violence-related burglary and criminal mischief. He was given a 540-day jail term with all but seven days suspended on condition of restitution for damages and mental health treatment. Jadama was to appear in court next Monday to review his compliance with the sentencing conditions in the burglary case. White said the commotion of the incident scared her 2-year-old daughter, who thought there was a monster in her room. White, however, was mostly annoyed that the incident was happening in the middle of the night. "I was more concerned that they would keep my kids up," she said.